We pull into the gravel road that circles through the interior of the cemetery. I’m not sure where the grave is. My research indicates there’s a marker. I’m thinking it marks the actual grave. I see a marker by the roadside at the edge of the cemetery. Turning into the graveyard, I assume that’s where the grave is, but as I drive up the moist lane, I notice yet another sign – not a marker, but a real sign – indicating the grave I seek lies well within the burial grounds. I exit the car, with camera, and walk in the direction the sign designates. I see the well-marked grave and position myself to the west of the headstone to snap a picture. The tombstone reads “Capt. Daniel Shay (sic) – Revolutionary War – 1747-1825.” The heavy granite stone doesn’t look vintage, at least compared to the contemporary gravestones that surround it. Planted next to it is an easily seen metal sign with “Captain Daniel Shays” printed in gold on a blue background. But that’s not why he’s famous. Following his retirement, Shays led the quiet farm life in the western Massachusetts town of Pelham (now called Prescott). Things didn’t stay quiet. Most Revolutionary War veterans found themselves paid in Continental Script. The economic recession that followed the Revolutionary War made this paper currency worthless. The government of Massachusetts, consisting mainly of the wealthy class, decided it would only accept hard money (gold and silver) to pay taxes. Making matters worse, the State’s huge war debt led to an aggressive tax policy. The farmers of western Massachusetts couldn’t get paid in hard currency and couldn’t afford the higher taxes. By now, Massachusetts found itself in a virtual civil war, with the government’s army manned mainly by elites from the eastern half of the state and Shays’ men mostly poor farmers from the western half. In late January of 1787 (why does that year mean something? ), Shays’ army met the state forces at the Springfield armory, but did not fire. The government men-at-arms proved less accommodating and fired their canons into the crowd of protestors, killing four. From there, “Shays’ Rebellion” ended and Governor Bowdoin charged Shays and his leadership with treason. Two were executed, but by then Shays had escaped. He would eventually settle in Scottsburg in what was then the Town of Sparta in Livingston County. Bowdoin lost the next election and the new governor – John Hancock – pardoned all the men. Daniel Shays died in obscurity. A few months before Shays’ death, Lafayette returned to America to celebrate the fiftieth anniversary of the start of the Revolutionary War. All surviving heroes were invited to see the elder French statesman. All except Daniel Shays. 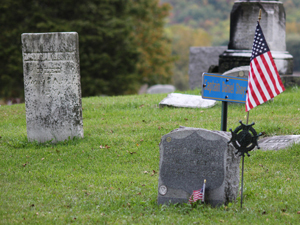 Do you have any information on James Ogdon, who is also buried at Revolutionary War cemetery on the eastern side of Conesus Lake. Just was there, and tried to google search his name, and nothing listed in NY. His Headstone is very high, and a small black iron fence surrounds it. Not in my notes. Do you have anything that I might be able to use as a lead?